Yes, you read that correctly… today, I bring you the recipe for this HEALTHY Citrus Pound Cake! Did your jaw drop to the floor? Did you just question my sanity? Because obviously, there is no such thing as a healthy pound cake… right?? I think we just made history… this is a day that the history books need to include! It seems too good to be true, but it’s not. 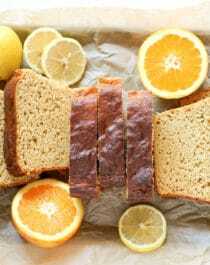 This Healthy Citrus Pound Cake is incredibly soft, sweet, and full of refreshing lemon and orange flavor, yet it’s made without butter, excess oil, refined sugar, and artificial flavors. One bite and you’d never know it’s sugar free, high protein, and 100% whole wheat! This Healthy Citrus Pound Cake will satisfy your sweet tooth without giving you a sugar rush or sugar crash. It tastes buttery too, even without the butter, so you won’t miss that butter flavor typical to classic pound cakes. One huge plus about this recipe is that it’s totally breakfast-worthy, so be sure to bake this and EAT IT UP! If you’ve read My Story, then you know all about my childhood addiction to sugary, buttery, baked goodness. Even though I studied Nutrition in college, have been baking healthfully for over 6 years now, and have kicked sugar to the curb, I still get tempted by the unhealthy sweets at bakeries and cafes. I’m sure everyone gawks a little hard at the perfectly laid out slices of pound cake at the Starbucks checkout line. No worries, I’m guilty of it too. But why buy their artificial, overly processed, sugar-in-a-loaf cake when you can have this WAY better version? This Healthy Citrus Pound Cake was a long time coming. I first posted the recipe for this cake back in 2011, but wanted to simplify the recipe (previous recipe had way too many ingredients and steps) and give the post a little sprucing up with better pictures (I’ve learned a lot over the last 6 years!). Typical pound cake recipes can call for up to 4 sticks of butter (!!! ), 2¾ cups of sugar, and 8 egg yolks. Ummmm, no thank you? I’ll make my own, and make it healthy while I’m at it! Let’s take a walk through the trials, shall we? This trial was surprisingly a successful one! The texture was pretty good — moist and very dense — but the flavor could use improvement. I used 1 tablespoon of lemon zest, which ended up being a little too much and tasted bitter. I think the cake could use more butter flavoring too. I increased the starch, the butter flavoring, and applesauce, and reduced the oil. I baked the previous trial at 325 degrees Fahrenheit, which I increased to 350 degrees this time around. I also baked the cake in mini loaf pans, which is probably why they rose so much in the oven. This cake was mighty tasty with a tight crumb… definitely a cake I’ll be making time and time again. 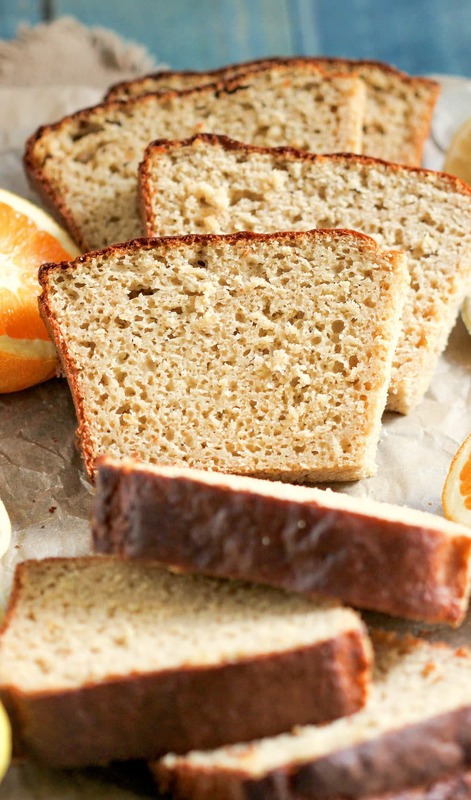 This Healthy Citrus Pound Cake is sweet, moist, fluffy, and buttery. It tastes just as good as the real thing, but it’s made without any of the nasty ingredients typical to classic pound cake. Let’s skip out on the refined white sugar, excess butter and oil, and bleached white flour, and make this better-for-you version instead! 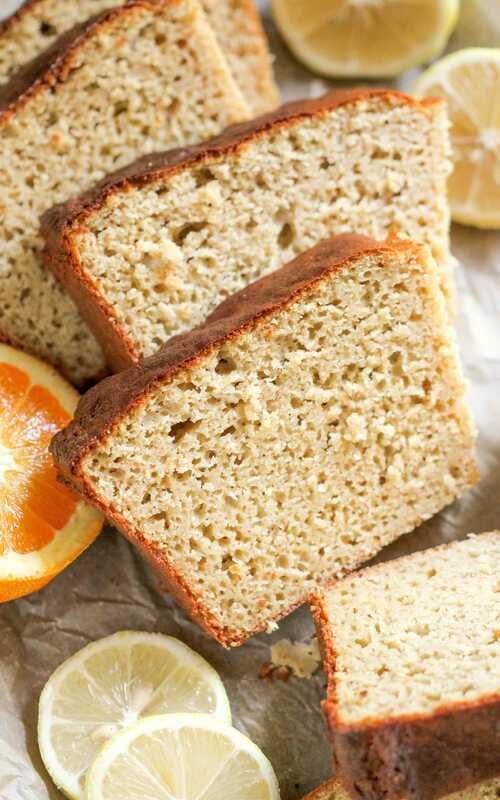 This Healthy Citrus Pound Cake is incredibly soft, sweet, and full of refreshing lemon and orange flavor, yet it's made without butter, excess oil, refined sugar, and artificial flavors. Preheat the oven to 350 degrees Fahrenheit and spray a 9×5″ loaf pan with cooking spray. In a small bowl, whisk together the whole wheat pastry flour, starch, protein powder, baking powder, baking soda, and salt. In a stand mixer bowl fitted with a beater attachment, add the applesauce, yogurt, eggs, oil, erythritol, stevia, butter flavor, and zest. Mix on low speed until smooth and even. 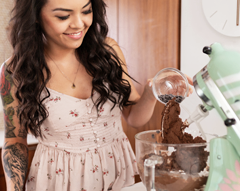 Dump the dry ingredients into the stand mixer bowl and mix until ALMOST combined. Scrape down the sides of the bowl and mix one more time, JUST until the batter is even. Pour batter into the prepared pan and bake for ~55 minutes, or until the surface forms a brown crust and springs back when tapped. Let cool completely in the pan, then slice and serve! Keeps for ~1 week in a tightly sealed container in the fridge. Daaaaaang! Only 250 calories for a big ol’ slice of POUND CAKE? Plus 8g of protein and 4g of fiber?? If you want to top the cake with an icing, try this White Icing Recipe! Hello, I think it’s wonderful that you can make such healthy treats but quite a lot of your ingredients like whey protein, sucanat, date sugar, stevia..are alien to me and can’t be purchased anywhere near where I live. Could you create something more ‘user friendly’? or is this blog only for some specific reader? If you don’t mind the cholesterol in whole eggs, you can try using 2 eggs… or possibly even more yogurt. Good luck! Can’t wait to try your pound cake! It’s one of the desserts I really enjoyed growing up since my great grandmother often made them when she was alive. And I love that you’re not afraid to tackle foreign ingredients. One question, does Whole Foods carry the butter extract? I’ve never heard of such a thing! I’ve gotten butter extract at Whole Foods before, but most of the time I get it at smaller stores like Mrs. Greens or NatureWorks (just small health food stores). 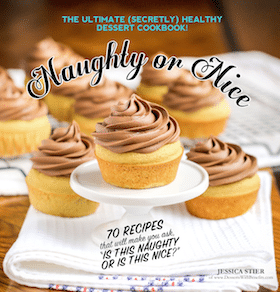 Jessica, I found your recipe while searching for a “healthy” high fiber, low calorie pound cake. I plan to try the recipe without the icing, however do you happen to know the caloric value of a specific serving size of the pound cake no icing? As I am not a baker or nutritionist is there a easy way to make this a lo glycemic cake for my husband (who enjoys pound cake!!) that is trying to lose weight and has DM type II. 1/8 of the recipe is the serving size (1 slice if you make the large loaf). 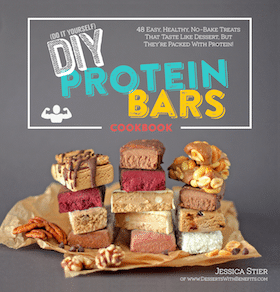 Without the icing, 1 serving/slice has 246 calories, 5.9g fat, 40.5g carbs, 4.25g fiber, 7.5g protein.